Here at MegaCorp, we work with customers from all industries with different shipping needs. Some of our clients ship one truckload a month, others ship hundreds of truckloads a week. We have the feel of a family owned company (we are family owned and consider our team the MegaFamily) with the resources of a large corporation. Our unique Corp model has a small team of people working on your account so there is always someone available that is well versed in your shipping needs and requirements. We have been chosen to work with many Fortune 500 companies and named as a Top 50 Logistics Provider. We have teams in the office 24/7/365 so there is always someone available to take your call. Our account managers work on teams to ensure nothing is overlooked and that someone is always there for our clients. No loads are left on the dock once MegaCorp commits to hauling your freight. View our capacity map below. If your load is not on a MegaCorp Lines truck, it is on one of our carrier partners trucks that has gone through an extensive setup process and background check before becoming an authorized carrier partner. Dedicated claims department just in case an accident or weather event does occur. Above industry standard for cargo, liability and auto insurance. Certificates available upon request. Our Carrier Setup Team reviews all carriers that we work with before they are loaded to prevent scams and theft. We can create monthly, quarterly or yearly reports to show you any data that you desire regarding the loads we haul for your company. Our industry leading technology, created in house by our logistics experts to aid in top-notch service, tracking, quotes and reporting. 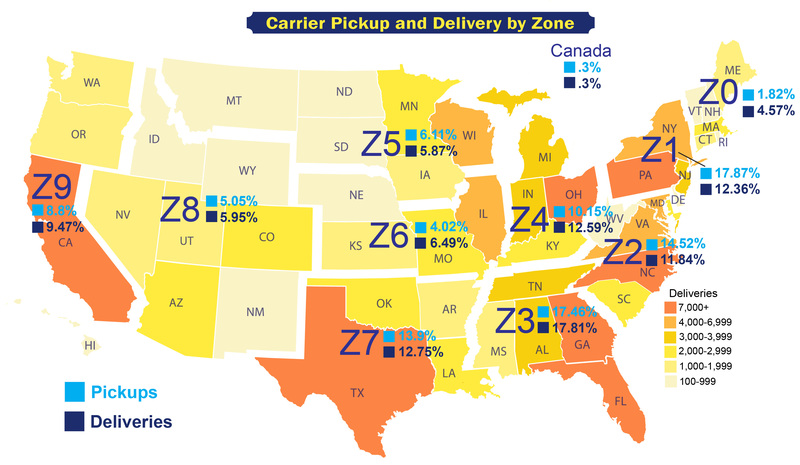 The image below shows the inbound and outbound volume of our nationwide capacity by zone.